What day of the week was I born on? What day will my birthday be on? What day will our anniversary fall on? 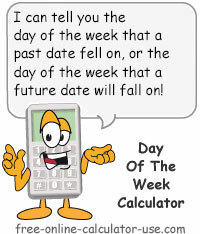 Select the month and day and enter the 4-digit year of the date you wish to find the day of the week for. This is the day of the week of the entered date. This calculator will instantly tell you whether the date you entered is a Monday, Tuesday, Wednesday, Thursday, Friday, Saturday, or Sunday. Just select the month and day, enter the 4-digit year, click the find button, and viola! What day will Christmas fall on this year? What day will my birthday fall on this year? What day will a loved one's birthday fall on this year? What day will my 30th, 40th, 50th, etc. birthday fall on? What day does our anniversary fall on? Select the month and day, and enter the 4-digit year of the date you wish to find the day of the week for. Click the "Find Day of Week" button.